Dentures come at a high price and must be properly taken care of so they last a long time. Dentures today have the look and feel of your natural teeth. Unfortunately, they are not your natural teeth and it can be hard to give up foods and snacks that you used to be able to freely enjoy. Things like gum can cause big problems for denture wearers. If gum gets stuck on your dentures, do not worry. You can remove gum from dentures yourself with a little effort. Because of the smooth texture of dentures, it is generally relatively simple to remove the chewing gum. No matter what the method, be aware that some dentures can be very fragile. Use extreme care when handling them. Never use sharp objects to remove gum and do not scrub them vigorously. Remove as much gum with your fingers as you can. 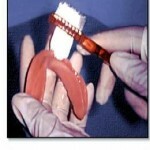 Using the gum itself to tap flecks of gum of the dentures. Do not smear the gum as this will make it harder to remove. Turn a hair dryer onto medium-high heat if gum residue remains. Concentrate the hot air over the gum until it is very soft. Use tweezers if the pieces are difficult to remove. Soak dentures in hot water, but not so hot you cannot put your hands in the water, to soften any remaining residue. If you do not want to use hot water, you can place them into a glass of ice water instead. The ice will freeze the gum and then the gum can be pulled right off. However, it must be remembered that the dentures must not be exposed to extreme cold, such as be placed inside a freezer in the fridge, as this will lead to chipping and cracking of the dentures. Soak the dentures in distilled white vinegar if the gum residue is still visible. Let them soak for at least five minutes. If not, Heat up a mixture of 1/2 cup white distilled vinegar and 1/2 cup water to nearly boiling; let sit for five minutes. Dip a toothbrush into the vinegar and scrub the affected area of the dentures. Use a soft cloth to remove excess gum from the toothbrush and repeat, removing as much of the gum as possible. Rub vegetable oil over the chewing gum with a soft cloth. Work in a circular motion until the residue is gone. Rotate the cloth regularly to a clean area while working off the gum. Follow this by gently using the denture brush to swipe any remaining gum from the dentures. 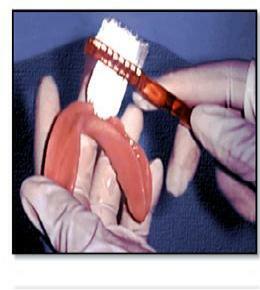 If this does not help, take you denture to your dentist, who will send it to his dental lab and they will remove it. Avoid chewing gum that is not approved for denture wearers. Most dentists will not recommend the use of vinegar (at least not long term soaks) with partial dentures because it can be corrosive to the metal component of the appliance. Avoid using brushes with stiff bristles, as they can damage the denture material. Freedent offers a non-stick chewing gum option in three great-tasting flavors – peppermint, spearmint and winterfresh. Eating with new dentures will take a little practice and may be uncomfortable for a few weeks. One technique is to chew the gum slowly and try to avoid it to come in contact with the denture and avoid sticking the gum with it. Do not use alcohol, abrasive cleaners, bleaches, whiteners they may scratch the surface of the denture and harsh products like bleach which will turn the pink parts of your denture white. Do not use boiling water, dishwasher or microwave to clean or soak your denture because it will warp them. 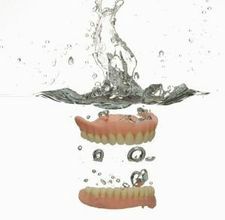 Valplast dentures can be cleaned with Stain Away or Cleanit. Thanks so much for sharing this. It takes a lot of care to prevent the need for denture repair, and removing gum is one of the main concerns. Ur welcome, thank you for taking time to read my article too! hope to get more feedback from you in my other articles!